If you are a use of Android devices, then you may be aware about, Clean Master. Company behind the Clean Master, the Cheetah Mobile has released this cleaning software for PC also. The Clean Master comes with easy and beautiful user interface, has a bunch of cleaning tool. It can be used in place of CCleaner freeware tool to keep clean and junk free Windows. Even though this is an initial release of Clean Master for Windows, it can scans over 500 popular programs for junk and helps you remove the junk files created by the software, web browsers, videos, audios, social networking and online games. 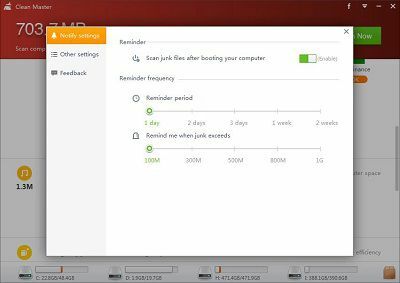 The best part of this free Clean Master is, after scanning your PC for junk files, Clean Master shows the locations and apps containing those junk files, along with Junk files size. Cheetah Mobile Clean Master is easy to use. Just install it from the download link which is provided at the end of the article, run the app, and on right side top corner click on “Clean Now”. With a just one click it will scan whole system for unwanted files and registry issues. Clean Master also comes with a reminder tool. It can remind you to clean after a specific period or also while the junk file exceeded in your system, after a specific size. It can scan and clean over 500 popular programs, and is compatible with Windows XP, Windows Vista, Windows 7, Windows 8 & Windows 8.1 operating systems.